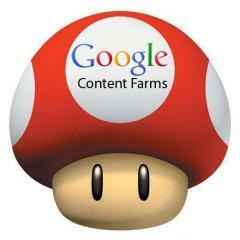 All the SEO and Webmaster community has been interested in in the past couple weeks is the Content Farm Update, also known as the Farmer or Panda update. For the first time, Google has responded to webmasters with advice. Well, it actually wasn't the first time, but I'll get to that later. In the ongoing Google Webmaster Help thread, the one posted by Google for Webmasters to appeal to Google, Google's Wysz posted some advice. He said in short, if you were hit, review your content and any content you think Google would classify as "low quality" get rid of by deleting it or moving it to a new domain. I wanted to update this thread with some additional guidance for those who have sites that may be affected by this update. Our recent update is designed to reduce rankings for low-quality sites, so the key thing for webmasters to do is make sure their sites are the highest quality possible. We looked at a variety of signals to detect low quality sites. Bear in mind that people searching on Google typically don't want to see shallow or poorly written content, content that’s copied from other websites, or information that are just not that useful. In addition, it's important for webmasters to know that low quality content on part of a site can impact a site's ranking as a whole. For this reason, if you believe you've been impacted by this change you should evaluate all the content on your site and do your best to improve the overall quality of the pages on your domain. Removing low quality pages or moving them to a different domain could help your rankings for the higher quality content. We've been reading this thread within the Googleplex and appreciate both the concrete feedback as well as the more general suggestions. This is an algorithmic change and it doesn't have any manual exceptions applied to it, but this feedback will be useful as we work on future iterations of the algorithm. One thing that is very important to our users (and algorithms) is high-quality, unique and compelling content. Looking through that site, I have a hard time finding content that is only available on the site itself. If you do have such high-quality, unique and compelling content, I'd recommend separating it from the auto-generated rest of the site, and making sure that the auto-generated part is blocked from crawling and indexing, so that search engines can focus on what makes your site unique and valuable to users world-wide. Read that second part closely, pretty much the same advice. So if you were hit, either delete the low quality content, which I know many many webmasters are doing - or move them to a new domain or maybe subdomain. Vanessa Fox covered this thread last night at Search Engine Land and also summarized the content farm session from SMX.